To lay siege and penetrate the walls of a castle often took months or years. If the walls could not be penetrated the attacking force would surround and starve the castle inhabitants. This type of warfare was used by Europeans and learned by the Arabs during the crusades. Most battles were fought during the better weather of summer. Battering rams were used to crash down doors, or to crumble walls. Often a fallen tree was used, or if time allowed one was rolled in. These large versions would often swing from heavy ropes. Often used for chopping, especially designed for combat. 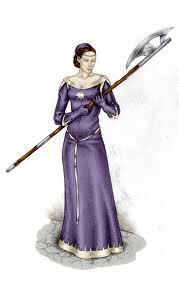 The smaller battle ax could be wielded with one hand and the larger with two. They weighed 1 - 6 lbs and were from 1 to 5 feet in length. 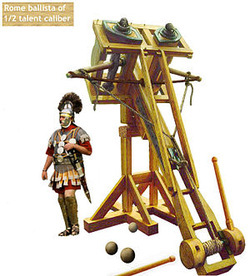 After 1100 BC became a popular long-range weapon. 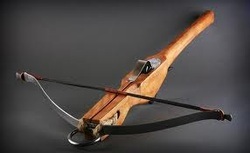 It is similar to the bow and arrow but conceals easier. 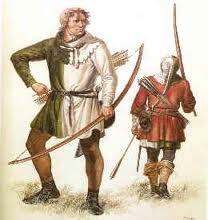 The arrows for the crossbow were metal bolts which were shot with great force and were easier to carry than arrows. A single-edge blade spear. They were used by foot soldiers and knights to maim and kill at a greater distance than most victims could defend themselves. Because of the length, they were not good for close quarter combat. 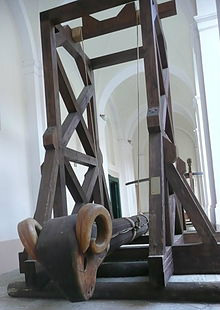 Heavy Calvary used long poles (9 - 14 feet) to knock opponents from their horses. In the 14th century it became a martial game (hatilude) where 2 horsemen ride at high speed trying to knock the other off, breaking the lance against the opponents shield or armor. 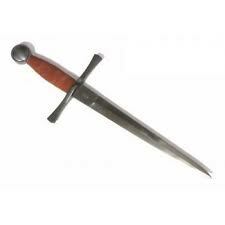 Usually used for ceremonial combat. A version of a spear used by knights on horseback. The end of jousting as a sport came In 1559 after the death of Henry II because of mortal wounds received from a jousting match. 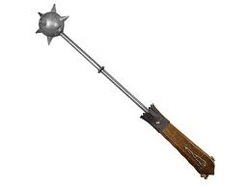 A large hand club with a spiked ball on its end. Some were fixed to a chain on the end of the handle (flail). Originally used by noblemen, they were popular in the 14th century because of the injury they could inflict on those wearing plate armor or chain mail. 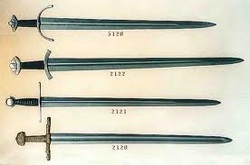 To enable cutting action on the back swing, most swords have double-edged blades There are many varieties from broadswords, claymores and sabers. Used in close combat against ones opponent. 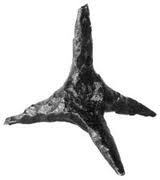 A caltrop is a multi-pointed metal spike. 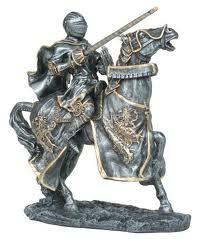 They were scattered in the path of oncoming invaders which slowed horses and footmen down. The predecessor to modern barbed wire. A two sided blade. Most soldiers carried one from simple to elaborate. They were used for close combat if the fighters sword was lost. Introduced to Europe from China in about 1250. 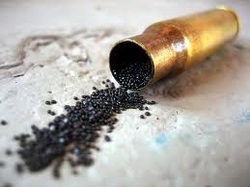 Gunpowder was used with little success until better understood. Eventually the Europeans used in bombs cannons and with guns. A long range offensive weapon. In skilled hands they were extremely accurate. There were 3 main uses for the arrows shot from the longbow: killing, poison dipped tips which ensured death or flaming tips to set fire to a distant object. The long-bowmen or archers were the soldiers who used this weapon. 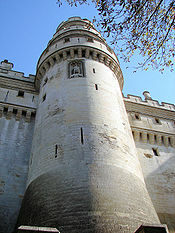 A floor opening usually between corbels of the battlement. Those in the castle could then drop stones, sewage, oil or other objects on the attackers below at the base of the castle wall. to set fire to the inner dwelling structures. Shields were used to protect each fighter from attack. 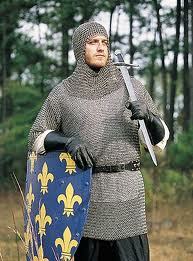 They were small for hand to hand combat or large to protect entire bodies. 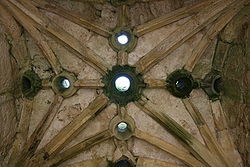 They were used to intercept attacks of arrows, swords and mace. Often made of heavy thick wood, but sometimes from lighter steel. They often were decorated with the family crest.